The New Jersey Generals of the United States Football League were 0-1 as they faced the Orlando Renegades, also 0-1, on March 1, 1985. The center of attention for New Jersey was rookie QB Doug Flutie, the diminutive Heisman Trophy winner out of Boston College who had struggled in his debut against the Birmingham Stallions. Flutie signed a five-year, $7 million deal to join the Generals, and was put even more on the spot when veteran QB Brian Sipe was traded away to Jacksonville, thus propelling the rookie immediately into the starting lineup. Head Coach Walt Michaels’ team had been heavily dependent on another ex-Heisman winner, RB Herschel Walker, in its first two years and had benefited from an influx of veteran talent that owner Donald Trump signed to bolster the roster. Flutie was hoping to rebound from a rough performance against the Stallions in which he misfired on his first nine passes, two of which were intercepted. The Renegades were the transplanted Washington Federals of 1983 and ’84 under new ownership and a new head coach in Lee Corso. The Federals had been a losing team, but RB Curtis Bledsoe and WR Joey Walters were quality players. Quarterback was a question mark with mediocre veteran Jerry Golsteyn starting, who was sacked eight times in a Week 1 loss to Tampa Bay. There were 32,748 fans in attendance for the nationally televised Friday night game at the Florida Citrus Bowl. They had little to cheer about, as the Generals dominated the first half. Orlando had difficulty generating offense with Jerry Golsteyn. Meanwhile, Doug Flutie’s mobility and the rushing of Herschel Walker and FB Maurice Carthon allowed the visitors to score three touchdowns in the first thirty minutes of play. Flutie threw to WR Clarence Collins for a nine-yard touchdown in the first quarter and connected with Collins, again from nine yards, for another TD midway into the second quarter. Just before the half, Flutie tossed his third touchdown pass, this time covering 25 yards to TE Sam Bowers. Roger Ruzek added the extra point after each and the score was 21-0 at halftime. In addition to his scoring passes, Flutie scrambled for 48 yards in the first half and continually kept the Orlando defense off balance. Walker and Carthon combined for 139 yards on 29 carries. Meanwhile, Jerry Golsteyn was successful on only four of 15 first half passes. Early in the third quarter, Orlando’s offense finally came alive and put together an impressive 10-play, 64-yard drive that stalled at the New Jersey 12. Jeff Brockhaus kicked a 22-yard field goal to get the Renegades on the board. However, Flutie tossed his fourth touchdown pass, once again to Collins on a 47-yard play that put the home team 25 points behind. Orlando finally scored again midway through the fourth quarter. Golsteyn threw to TE Bob Niziolek for a two-yard touchdown. It followed a Golsteyn completion to TE Don Echols that gained 18 yards to the three, where Echols fumbled into the end zone but, although Orlando recovered, the officials ruled the ball dead at the three. It was of no consequence to the outcome as New Jersey came away with a convincing 28-10 win. The Generals dominated in total yards (449 to 214), with 258 of that total coming on the ground, and had twice as many first downs (26 to 13) as Orlando. The Renegades also turned the ball over twice, to no turnovers suffered by New Jersey. Doug Flutie didn’t have a high-percentage passing day as he was successful on 11 of 24 throws, but they were good for 191 yards and four touchdowns while none were intercepted. Flutie also ran the ball 6 times for 57 yards. Herschel Walker, as was typically the case, led the ground attack with 110 yards on 25 carries and Maurice Carthon contributed another 91 yards on 20 attempts. 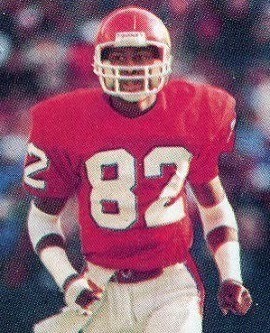 Clarence Collins (pictured below) was the receiving star with four catches for 82 yards and three TDs. For the Renegades, Jerry Golsteyn was successful on 12 of 27 passes for 138 yards and a TD while giving up one interception. Curtis Bledsoe ran for 68 yards on 15 attempts and also caught four passes for 29 more yards. WR Ricky Simmons gained a team-leading 37 yards on his two receptions and Bob Niziolek was right behind with 36 yards on three catches that included the club’s only TD. “It was a load off my back,” said a relieved Doug Flutie after a strong performance in a win for the Generals. The Generals went on to post an 11-7 record in finishing second in the Eastern Conference. They lost their Quarterfinal playoff game to the Baltimore Stars. Orlando continued to struggle and ended up at the bottom of the conference at 5-13. 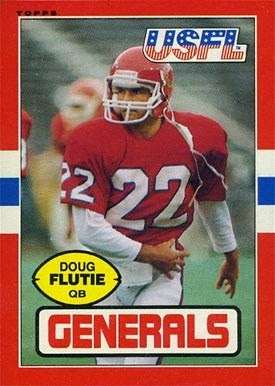 Doug Flutie passed for 2109 yards with 13 touchdowns and 14 interceptions, and, as he did against the Renegades, utilized his running ability to good effect in gaining 465 yards on 65 carries. A broken collar bone sidelined him late in the season. Clarence Collins caught just one more scoring pass over the course of the season, ending up with 27 catches for 566 yards (21.0 avg. ).